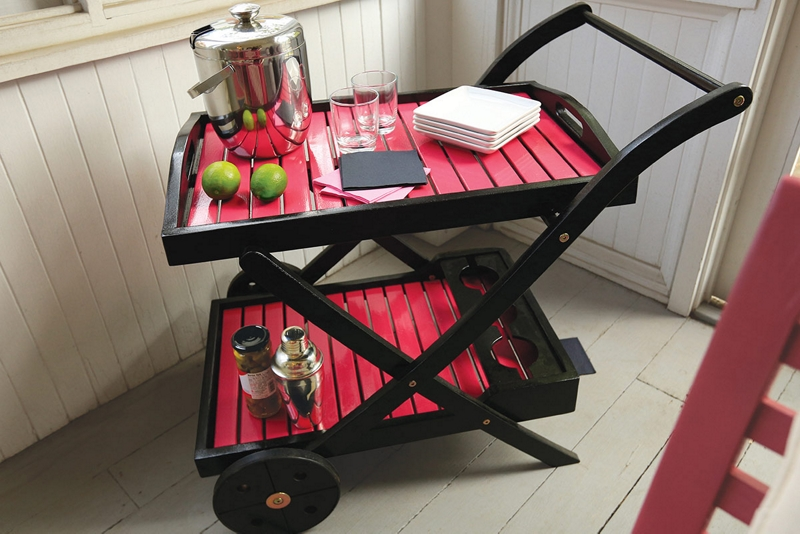 Give your guests the star treatment with a stylish Krylon® beverage cart. Prep surface by sanding any rough areas. Wipe with tack cloth to remove excess dust. Hold can of Krylon® ColorMaster™ Paint + Primer - Gloss Mambo Pink, 6-8 inches from the surface and paint using a sweeping side-to-side motion with slight overlap. Using painter's tape and a plastic bag, cover any Mambo Pink-painted surface area. Hold can of Krylon® ColorMaster™ Paint + Primer - Gloss Black 6-8 inches from the surface and paint using a sweeping side-to-side motion with slight overlap. Repeat step 6. Allow to dry overnight before using.